It’s not at all common to encounter a strategy that’s profitable when reversing the entry and exit signals, but simplicity and metrics generated by the Reverse MACD strategy merit further investigation. Figure 1 shows the results from a Monte-Carlo Lab “Trade Scramble” using the results from a weekly simulation from 1990. We found that running the strategy with weekly data tended to increase profit and reduce drawdown - another uncommon combination! Tradability may further be increased by installing a 20% stop loss, corresponding to a 2.4% max drawdown per position at 12% of equity sizing. Since the Nasdaq 100 constituents have had more than 200% turnover since 1995, it’s probably worthwhile to revisit this strategy with a dynamic WatchList that represents the current index. Figure 1. 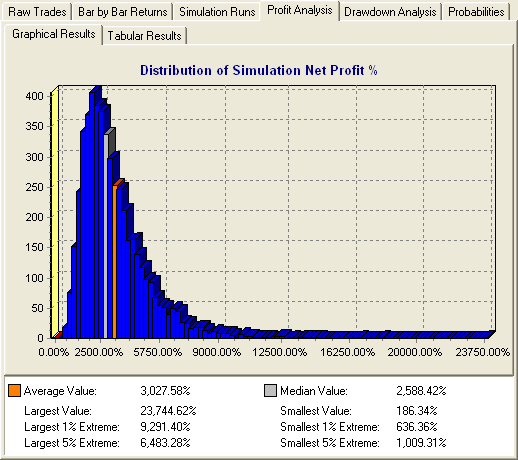 Monte-Carlo Lab Trade Scramble of weekly simulated trades, no options selected.